Life is just better after 10 minutes of cardio. So, the countdown for our new treadmill (a/k/a Nordi) is over. My husband surprised me when I got home with it already set up in the spare room! It is better than I remember it in the store. 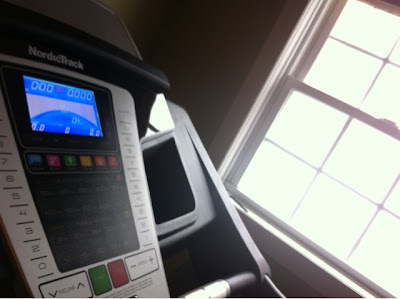 I plan on doing a full review of the treadmill after I get a few miles on it, but as of right now, I am in love! Even though I only spent 10 minutes on the treadmill, I did spend a good majority of my night in our new treadmill room. I put my yoga mat in there so I could stretch, do yoga, and have a comfy place to gaze lovingly at our new treadmill while also reading magazines. I must say, if there was ever a good time to purchase a treadmill, now is the time to do it. It's mid March and we got hammered with snow. 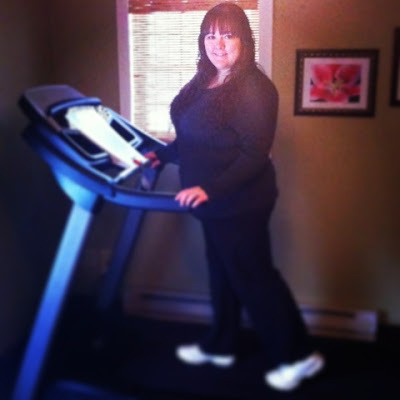 My legs have been itching for some action, and with this new treadmill, I can get my workout done, while staying out of the harsh weather outside! It was really nice to watch the snow fall through the window as I walked on the treadmill. The snow isn't the only thing I can watch, though. 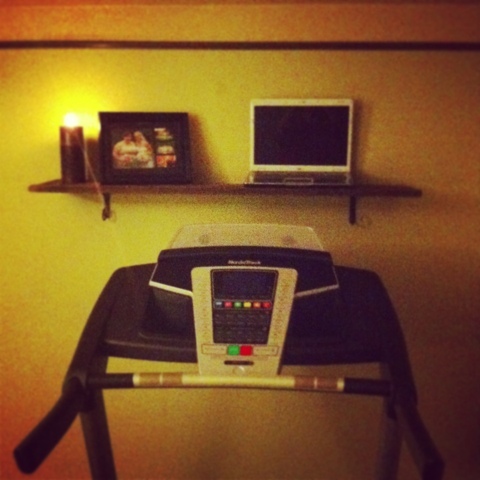 My husband also made a laptop shelf for me so I can watch Hulu and Netflix while I use the treadmill. I am one spoiled girl, alright! 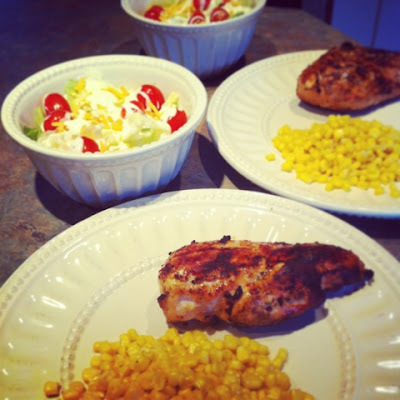 After my 10 minutes of cardio (I'm trying to break Nordi in slowly) my husband and I got to work on dinner. He made some amazing grilled chicken and I made corn and side salads to go with it. 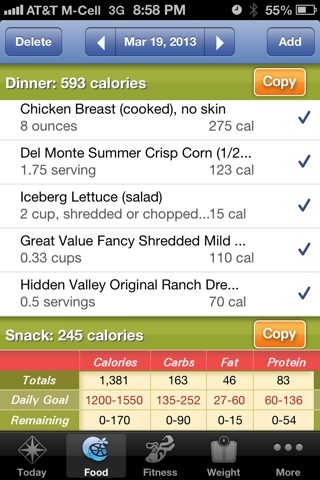 Yesterday was day two of staying within my calorie range. I am feeling the spark again! 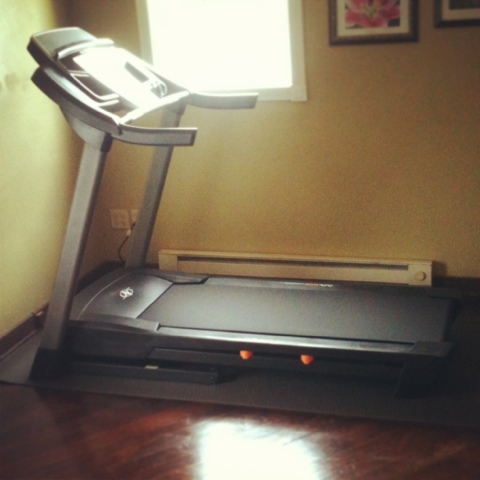 Motivated to keep this up and put my new treadmill to use! What makes you motivated to stay on track? 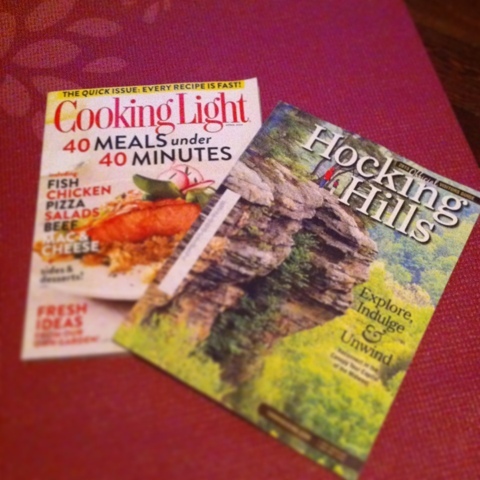 I've got a 5K race in May, and a lot of plans for the future! You are one lucky girl! I wanted to buy a treadmill too, but instead bought a gym membership. I love reading your blog, girlie. Keep up the good work! Congrats on the treadmill, what a sweet set up! We used to have one but we just hung clothes on it. HA! My current motivation is to lose weight before I go on a work trip to New Orleans in May. I won't be able to lose a whole bunch but enough so that I'm fiting better into some of my warm weather clothes. Keep up the great work! Your husband is so supportive, that is awesome. I wish mine was!! Congrats on the treadmill, it looks sweet. Looking forward for your review. Keep up the good work with staying in your calorie range. You are doing SUPER! !